Journalist, travel writer and friend of John Muir and his wife Louie. Eliza Scidmore visited Alaska for the first time in the summer of 1883, inspired by John Muir's reports of his Alaska explorations in 1879 and 1880. She and her fellow passengers on the Idaho became the first tourists in Glacier Bay. Scidmore wrote the first book-length travelogue on Alaska, Alaska: Its Southern Coast and the Sitkan Archipelago (1885) as well as a more comprehensive guidebook (1893), among the 7 books she would write. Mount Ruhamah and Scidmore Glacier and Bay are named for her. Scidmore wrote several letters to John Muir and his wife and visited them in Northern California. Their mutual friends included Jeanne Carr, Capt. Calvin L. Hooper, and Harry Fielding Reid. 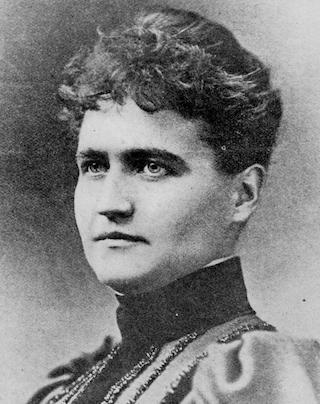 In 1892 Scidmore became the first female board member of the National Geographic Society. Her articles in National Geographic included one defending John Muir as the "discoverer" of Glacier Bay. An early proponent of conservation, Scidmore wrote for the influential magazine The Century on the country's new system of national forest reserves. See "Our New National Forest Reserves" by Eliza Ruhamah Scidmore The Century Magazine, September 1893, pp. 792-796. An extensive world traveler, she had deep knowledge of the Far East and wrote books on Japan, Java, China and India. In her best-known legacy, Scidmore introduced the idea of planting Japanese cherry trees in Washington and helped make it a reality in 1912 by enlisting the support of First Lady Helen Taft. In 1928 she died in Geneva, Switzerland at the age of 72, but was buried with her mother and brother in Yokahama, Japan. For more information, see the blog entry "Eliza Scidmore Joins John Muir Website" in this website of Eliza Scidmore's biographer Diana Parsell.